I stumbled across the no one’s listening podcast site and their interview with Noam Chomsky yesterday. The interview was entitled, Fake News; a title fitting his perspective on the American media. I have to admit though, after reading most of Noam’s work from the 80’s and 90’s, it was good to hear that he’s optimistic about the future. 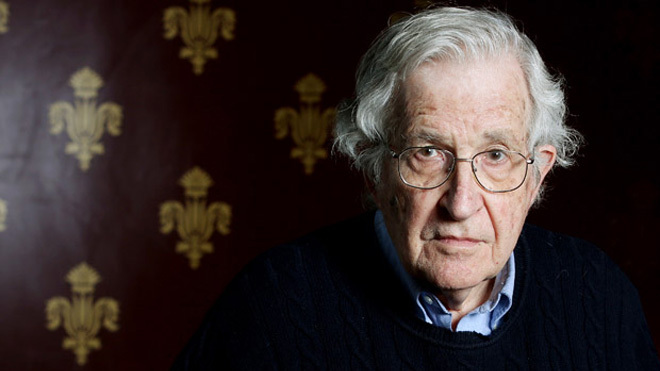 Noam: The effect [of the media] on the public isn’t very much studied, but to the extent as it has been, it seems that among the more educated sectors, the indoctrination works more effectively. Among the less educated sectors, the people are more skeptical and cynical. Noam: I think it’s a very optimistic future, frankly. Noam: Look, very much so. There’s something we know about this country more than any other: we know a lot about public opinion. It’s studied very intensively. Noam: But it’s very rarely reported. You can find them, it’s an open society, you can find them. What they show is very remarkable. What they show first of all is that both political parties and the media are far to the right of the general population, on a whole host of issues. And the population is just, you know, disorganized, atomized, and so on. This country ought to be an organizers paradise. And the, that’s why the media and the campaigns keep away from issues. They know that on issues they’re going to lose people. So therefore you have to portray George Bush as a, look he’s a pampered kid who came from a rich family, went to prep school, an elite university and you have to present him as an ordinary guy, you know, who makes grammatical errors, which I’m sure he’s trained to make, he didn’t talk that way at Yale and a fake Texas twang and he’s off to his ranch to cut brush or something. That’s like a toothpaste ad. And I think a lot of people know it. Given the facts about public opinion it means what’s needed is something, you know, not very radical. Let’s become as democratic as say the second largest country in the hemisphere: Brazil. I mean their last election was not between two rich kids who went to the same elite university and joined the same secret society where they’re trained to be members of the upper class and can get into politics cause they have rich families with a lot of connections. I mean people were actually able to vote and elect a president from their own ranks. A man who was a peasant union leader never had a higher education and comes from the population. They could do it because it’s a functioning democratic society. Tremendous obstacles, you know: repressive state, huge concentration of wealth, much worse obstacles than we have, but they have mass popular movements, they have actual political parties which we don’t have. There’s nothing to stop us from doing that. We have a legacy of freedom which is unparalleled, its been won by struggle over centuries, it was never given, you can use it or you can abandon it. So… I guess the question is who’s ready to begin sacrificing to elicit change?